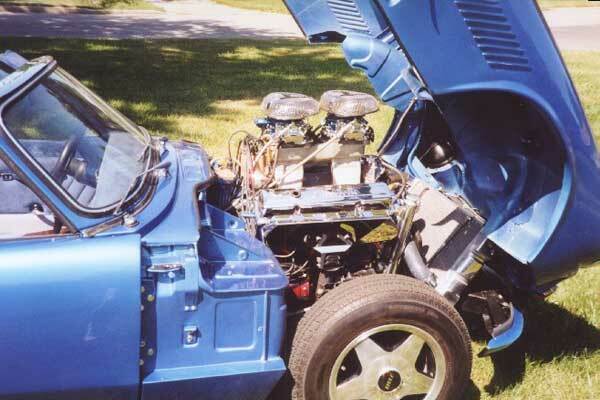 Intake: Offenhauser 360 manifold with Edelbrock/Weber Performer 500 four barrel carb. Mitsuba electric fuel pump. MR Gasket 14" chrome free flow air filter. Cooling: modified Renault 21 radiator (bottom outlet angle modified), fitted with twin Peugeot 205 electric fans in a custom modified housing. Standard Spitfire heater and control valve. Exhaust: (all stainless steel.) 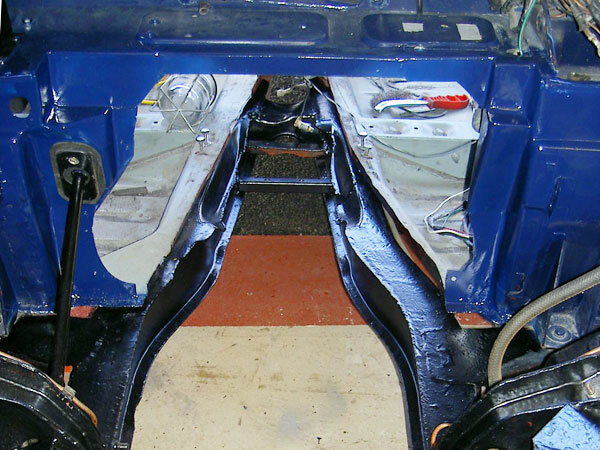 Modified MGB V8 block hugger manifolds with nearside exit pipe adapted to fit closer to the block. Custom fabricated Y-pipe. Phoenix Systems 1-into-2 and twin single rear straight through sports silencers. Transmission: LT77 5-speed, with Sherpa van short remote to correctly position the gearshift. 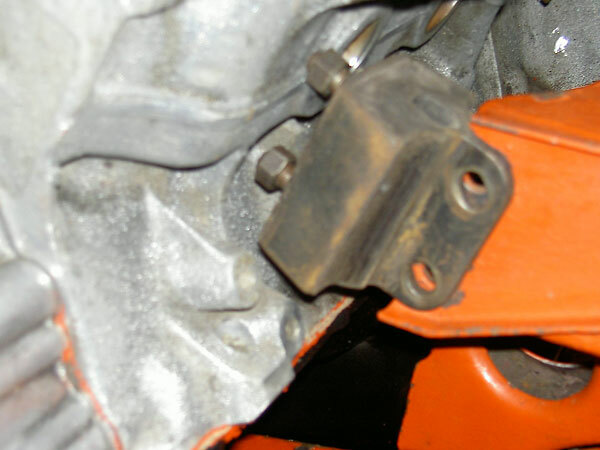 Standard Rover clutch, with TR8 master cylinder. 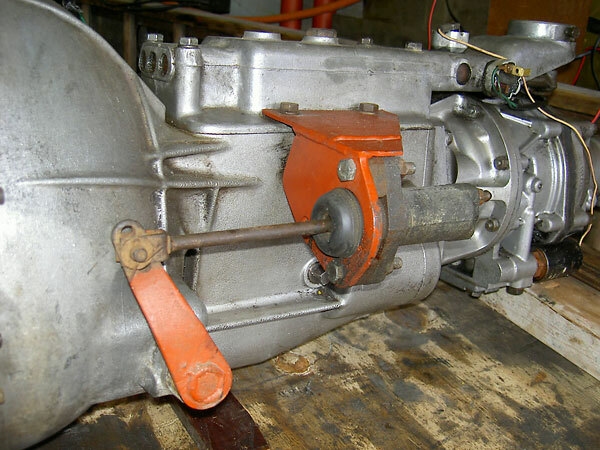 Driveshaft: Triumph TR8, with rear flange re-drilled to mate to Spitfire differential. Rear End: Spitfire 1500 - watch this space! 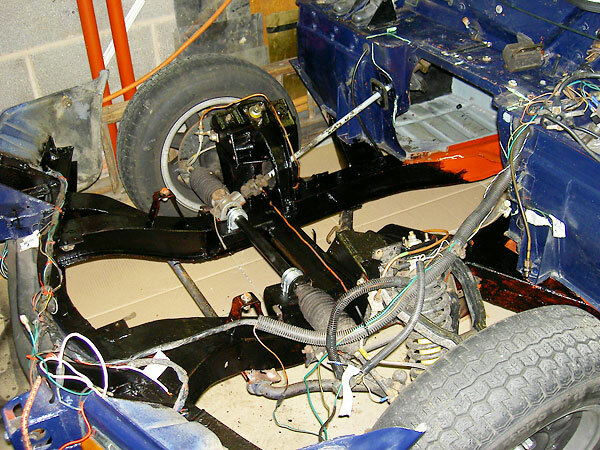 Rear Suspension: currently standard MK1V Spitfire with all new springs, shocks and bushes etc. - watch this space! Brakes: Spitfire master cylinder and Lockheed remote servo. Front - Standard GT6 MkIII calipers and rotors. Rear - Standard Spitfire MkIV drums. Wheels/Tires: unknown make/model alloy wheels, with 175/70/13 tyres. Electrical: modified MK1V Spitfire loom, with fused relays added for electric cooling fans, electric fuel pump, etc. Completed: on the road in May 2008. I doubt this conversion will ever be completed! 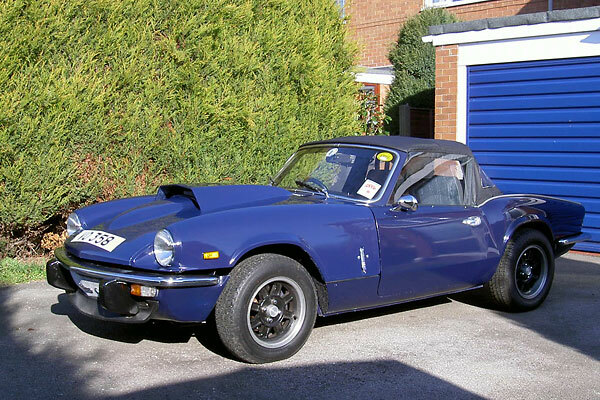 The story begins with a 1974 Triumph Spitfire Mk.IV which I purchased in 1984, slightly the worse for wear due to ravages of the British climate and unsympathetic previous owners. I got the car back into a reasonable state on a very limited budget and enjoyed running the car as a 1300cc. 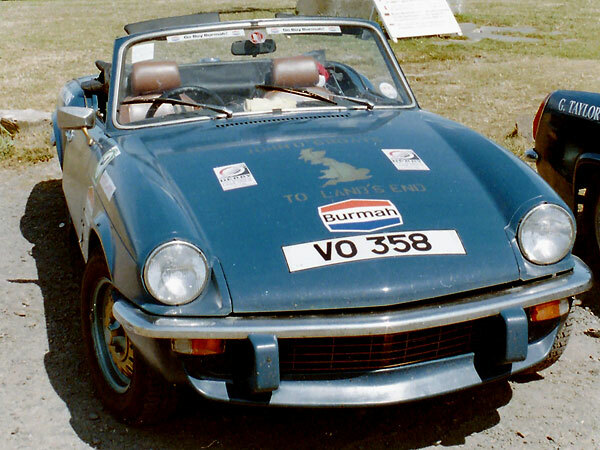 In 1988 I joined up with a couple of friends in a charity run from one end of our island to the other to raise money for a scanner for our local hospital. 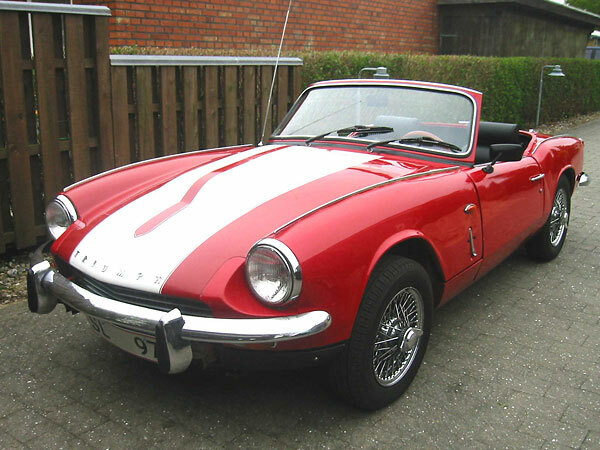 One friend drove his MG Midget and the other drove his Spitfire. The event involved driving from our homes in the East Midlands up to John O'Groats in Scotland, down to Land's End in Cornwall and then back home. My Spitfire ran superbly during this challenge, returning the best fuel economy and fastest turn of speed of all three cars. Towards the end of 1989 it became clear a proper restoration was required. Patching rusty areas wasn't keeping pace with decay. Luckily, by this time I'd made friends with an engineer named Jim Britland, who taught me many repair skills including how to weld. Also, now I had a house with a garage and an understanding wife. 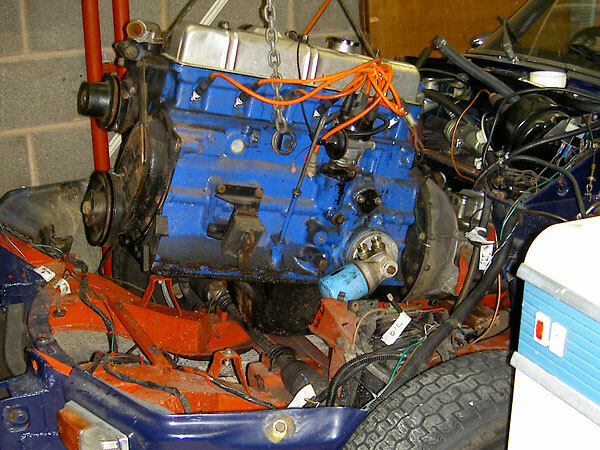 I decided to carry out a full body-off restoration and whilst the car was off the road I also decided to fit a Triumph six-cylinder 2000cc engine. During the next few years my Spitfire got new floor pans, a new boot floor, new rear wings, new inner and outer sills, and new door skins. I purchased a glassfibre GT6 bonnet because the original Spitfire bonnet wouldn't cover the bigger engine. 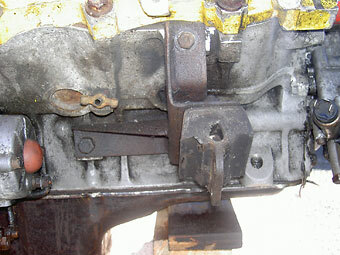 The engine and gearbox came out of a Triumph 2000 saloon. (I'd have preferred a GT6 engine, which would have come with a lighter flywheel, etc. - but this particular engine was too good an offer to pass by.) 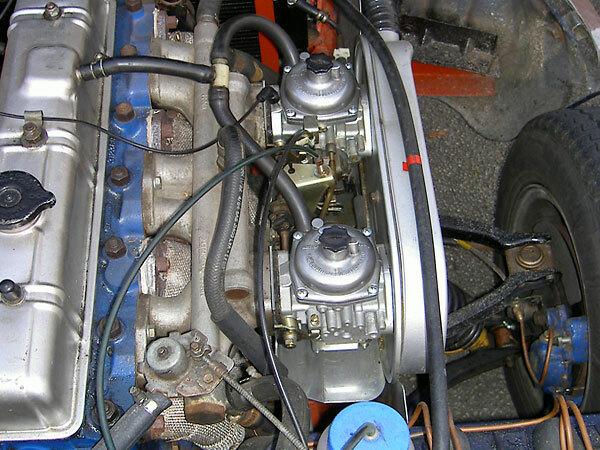 I completely overhauled the engine and fitted a new clutch, GT6 engine mounts, inlet manifold and carbs. 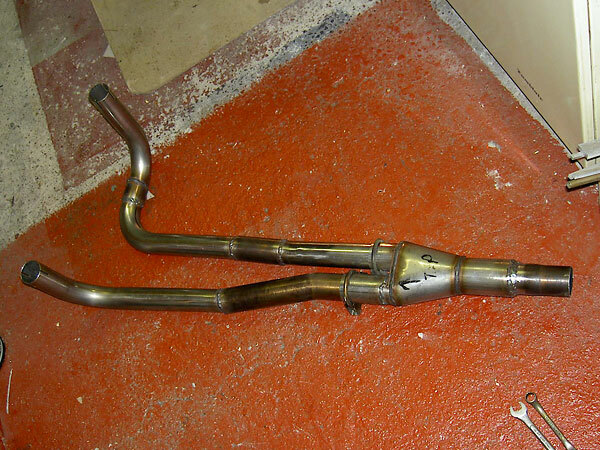 I even purchased a nice stainless steel six branch extractor and twin silencers from Phoenix exhausts. 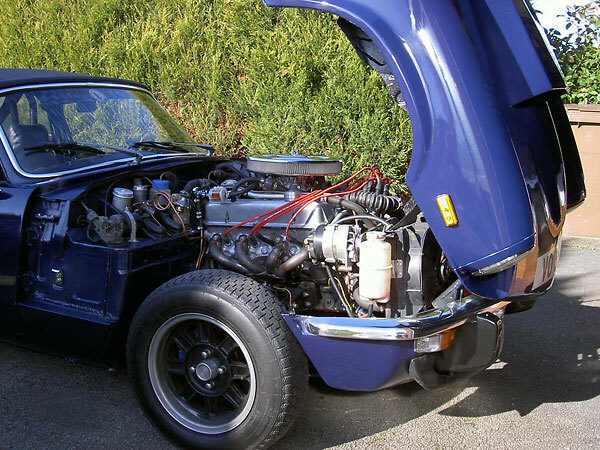 Triumph 2000 saloon engine... in a Spitfire! 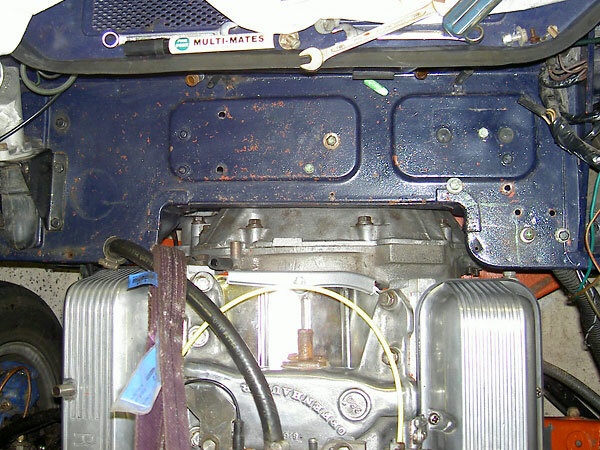 At the time, I couldn't source a GT6 radiator so instead I installed one from a Renault 21. 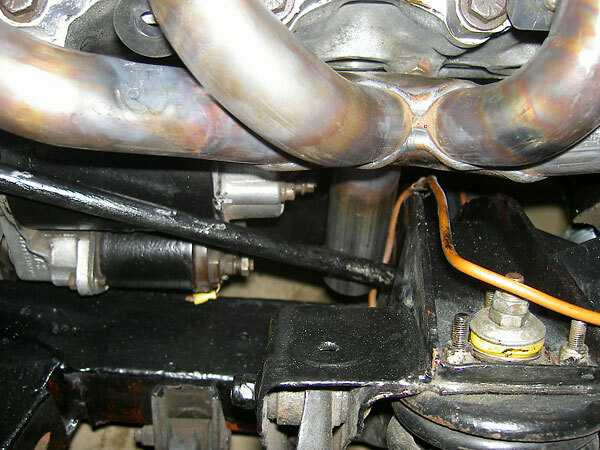 (It was necessary to modify the lower pipe.) I also installed twin electric fans from a Peugeot 205. This combination kept the engine at the right temperature. 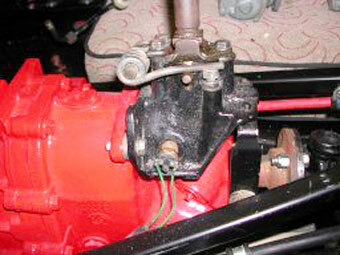 To get the 2000 saloon gearbox (with overdrive) into the Spitfire chassis meant some lateral thinking was required with the clutch slave cylinder and operating arm. Ultimately, I turned them 180 degrees and fabricated a new slave cylinder bracket. 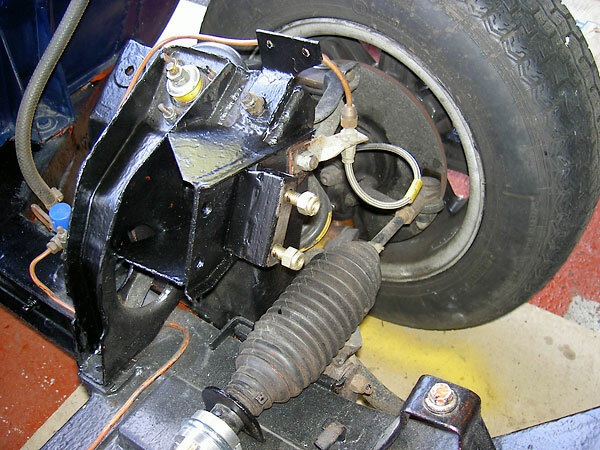 During this restoration period the front suspension and brakes were upgraded to GT6 items and a remote servo was added along with all new brake plumbing. New springs, adjustable dampers, and bushes were fitted all round. 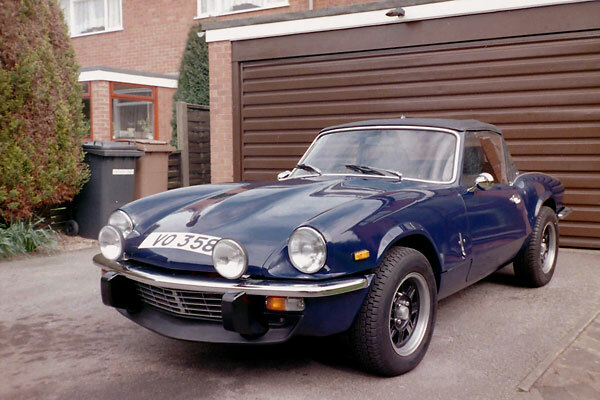 The car was completed in 2003 with several coats of Rover "Eclipse Blue" paint and a set of second hand alloy wheels. 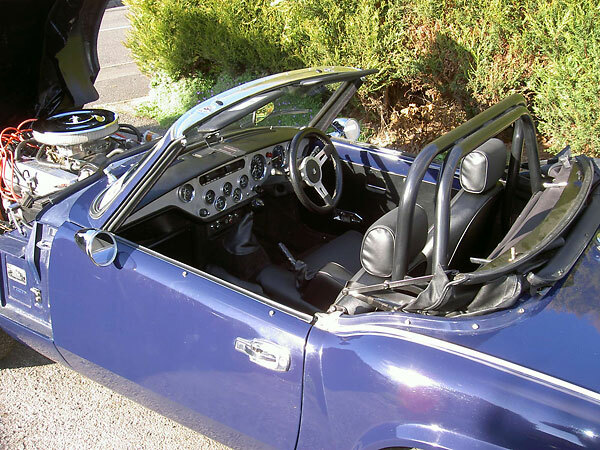 I ran the Spitfire in 2000cc form for the next four years, greatly enjoying its increased performance and novelty value, and carried on enhancing the car with such items as a new soft top etc. With the 2000 saloon gearbox and heavy flywheel, the car wasn't quick from a stop, but it was an excellent lazy cruiser and the exhaust made a beautiful sound. And then the madness set in! During this timeframe, my friend Jim was busy restoring an MGBGT. 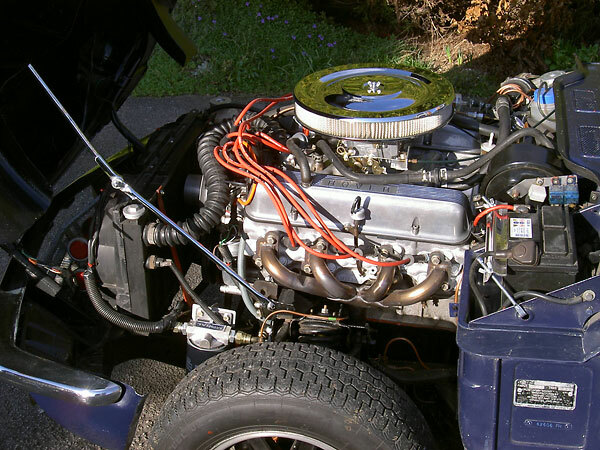 As part of this project, since he decided the 1800cc engine and four speed gearbox were tired, he would upgrade to a V8. Jim purchased an original factory MGB GT V8 with a very sorry body and transferred all the necessary mechanicals over to his restored body. 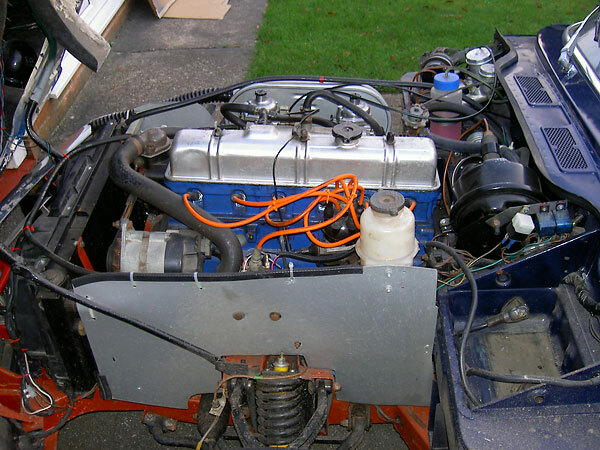 Over the winter of 2006-7, I helped Jim perform the V8 conversion on his MG and he had it on the road for spring 2007. And then the real madness set in... he let me drive it! 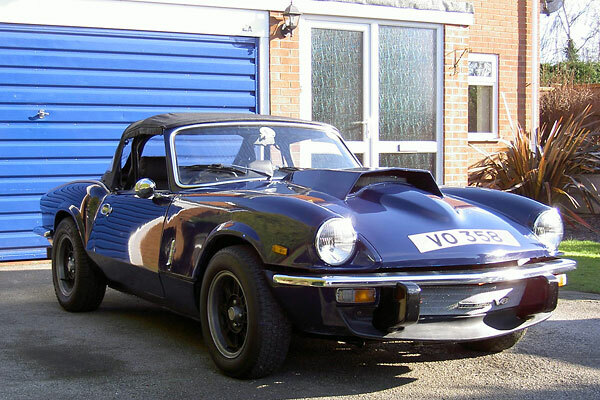 After driving Jim's MG several times that next summer, and hearing that famous V8 roar, I started looking into the possibility of putting a V8 in the Spitfire. 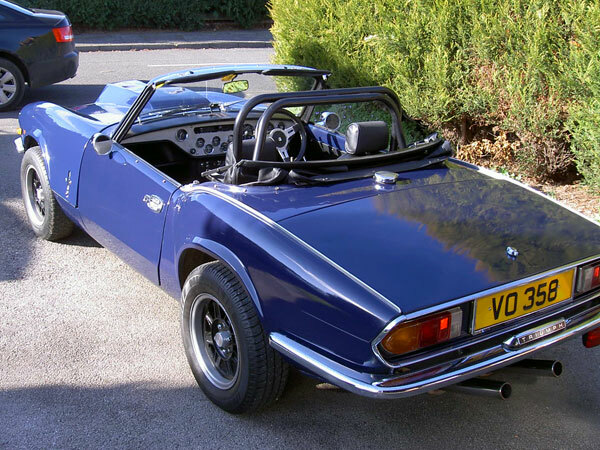 Most sane people would have sold the Spitfire as a six-pot and looked for a Stag to restore, but I had put a lot of me into the Spitfire over the years. It wasn't time to part company yet. Besides, the thought of a Spitfire with a V8 really appealed to me. I started trawling the internet for information. One night, as I was looking at Triumph Spitfires on Google, I came across a picture of Buddy Fares' 1962 Mk.III with Chevy 350. Wow! More importantly, Buddy Fares' conversion provided me a link to the BritishV8 website. I couldn't believe my luck! 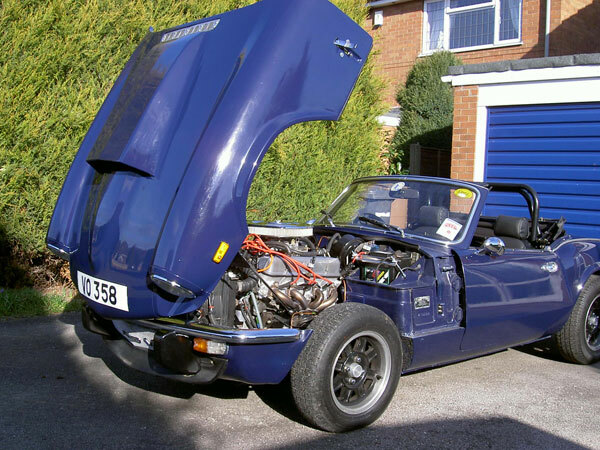 This excellent site gave me lots of inspiration and proved to me that a Spitfire V8 conversion could be done. 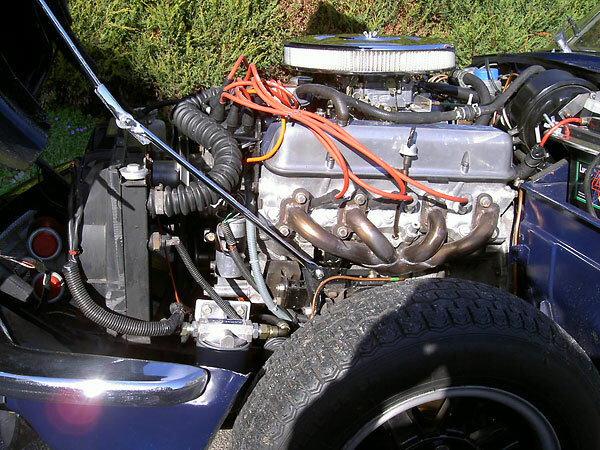 Although I would have liked to put a Chevy motor in my car, the cost and availability in England was going to be prohibitive, so I decided on the more readily available Rover V8 and started monitoring eBay for a suitable engine. Carsten Ullerup's "How It Was Done" write-up gave me much valuable information and spurred me on. Luckily, I came across an advert for a Rover V8 engine and gearbox. 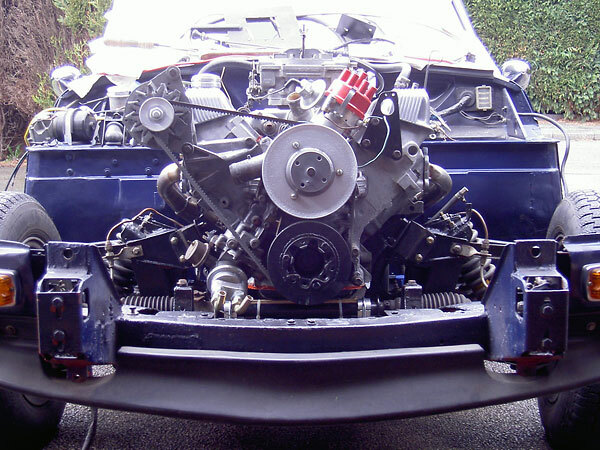 The engine could be heard running because it was still in its donor car: a TR7 V8 conversion. I bid on the car, but it didn't reach reserve so I contacted the seller and arranged to go have a look. 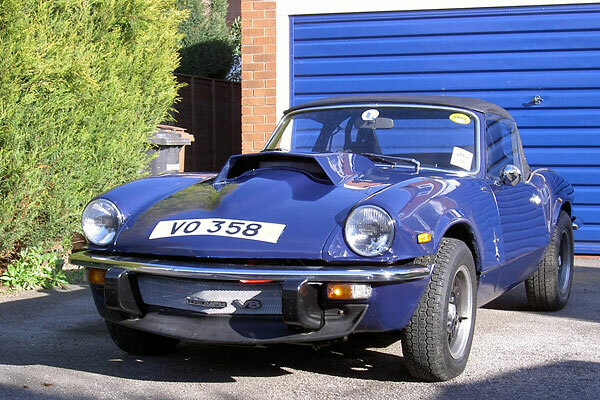 A trip up to North Yorkshire later and I had agreed to buy the car for the seller's reserve. 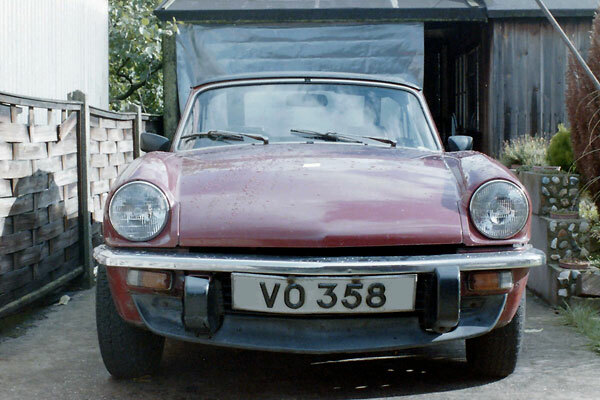 The car had only done 3,500 miles in the past 10 years and had been stored outside for some time. The body was completely beyond salvage, but the engine sounded good and it would provide me with all the ancillaries I needed as well as plenty of specialist TR8 bits that I didn't want but which could be sold on eBay to help recoup my investment. 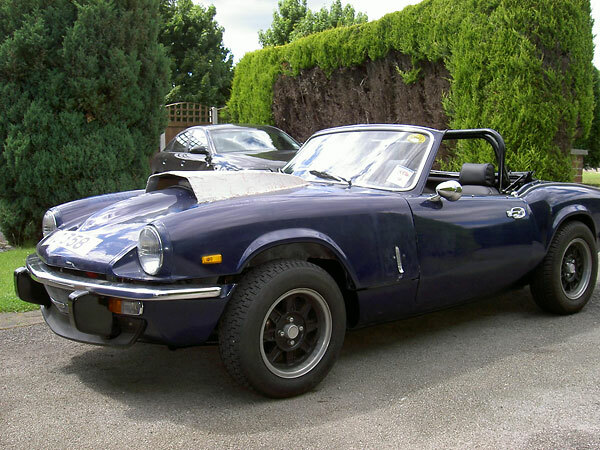 I took the Spitfire off the road in October 2007 and took the straight six out. Fitting the engine and box wasn't as difficult as I thought it would be. 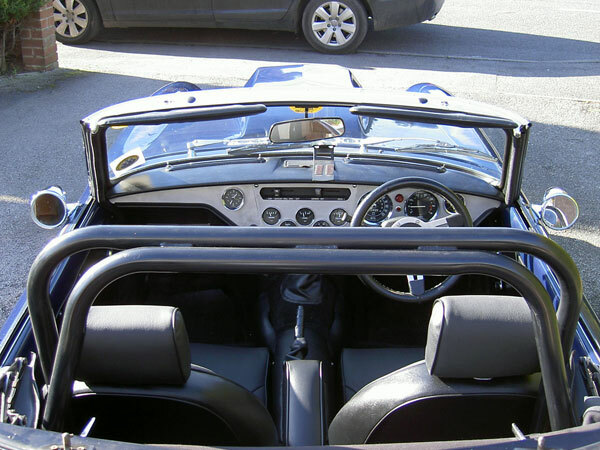 I was aware of two main issues, it needed to be as low as possible to give me as much bonnet clearance as I could get, and the gear stick had to fall in the right place. 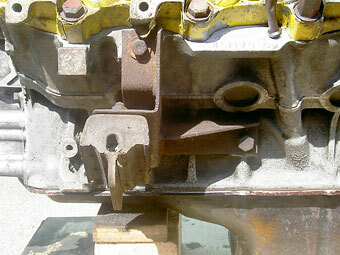 Removing the Triumph 2000 engine. 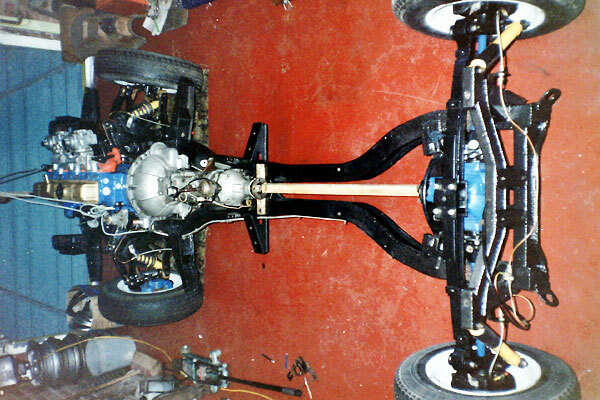 I had fabricated a lifting beam in the garage hung the engine in the place noting modifications needed to the bulkhead and frame. 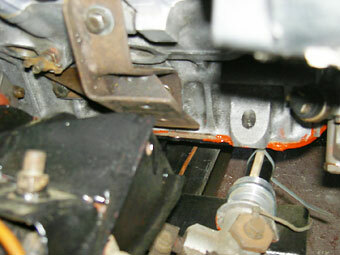 Clearance between starter motor and steering column was tight, as were the exhaust downpipes and the chassis rails. I had to modify the bulkhead quite a lot but only had to make minor adjustments to the chassis such as bending over and welding flat one or two flanges and remaking the gearbox support. 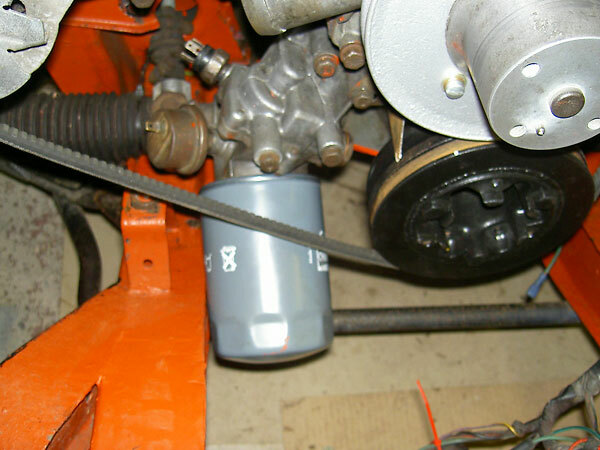 I also had to install a remote oil filter housing (from MOCAL). 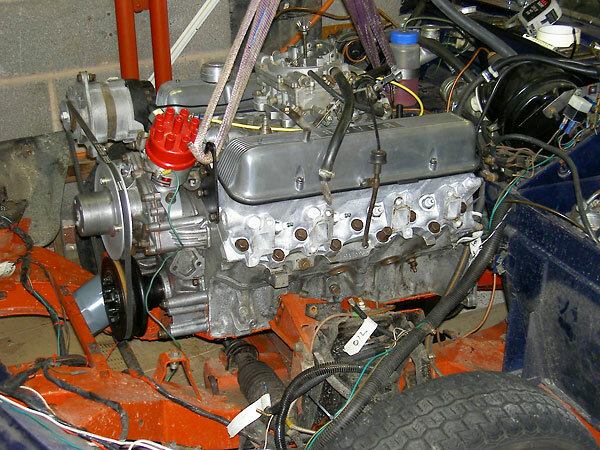 Trial fitting the Rover P6B engine. That's where the engine mount needs to be. The oil filter didn't really fit here. It will be mounted remotely instead. 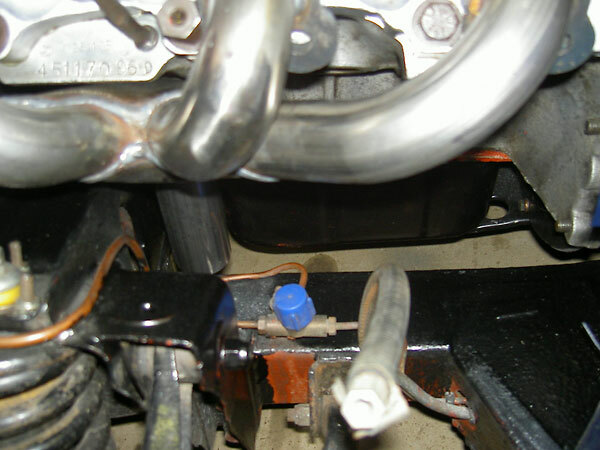 Small chassis mod needed to clear clutch cylinder housing. 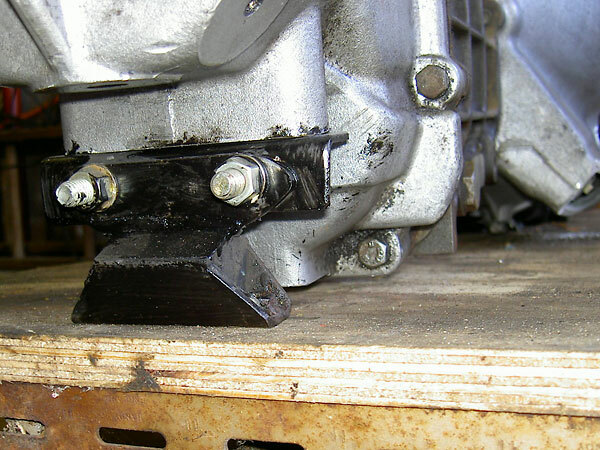 Jim and I modified the TR8 engine mounting brackets and made up a gearbox mount to allow use of a GT6 overdrive gearbox bracket. The engine was in! 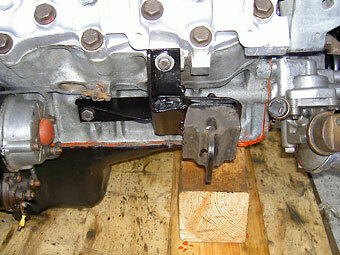 Bracket made to facilitate mounting gearbox with GT6 overdrive mount. 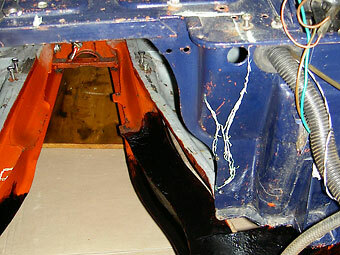 Front of chassis blacked prior to bulkhead mods. 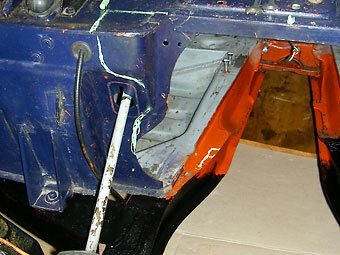 Modification of passenger side to turret for wider and further forward position of engine mount. Trial fitting. 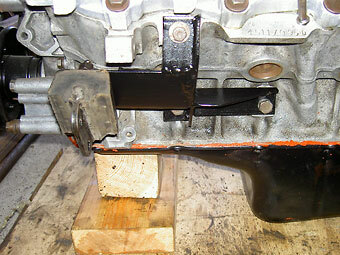 Oil filter take-off can be seen on left hand side. To position the gear shifter where I wanted it, I installed the shifter from a Sherpa van, shortened in height to suit my seating position. I also had to rebuild the tunnel cover. Sherpa van shifter is shown at right. 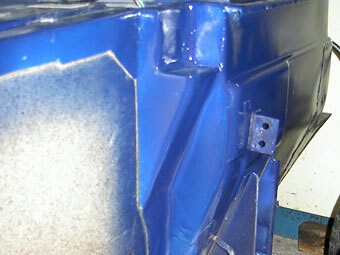 I reused the Renault 21 radiator, and it has proven well up to the job, with no overheating problems at all. 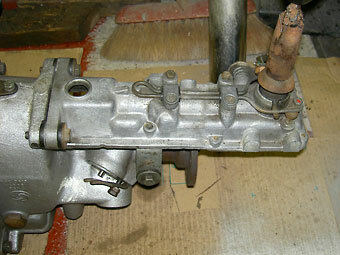 For the exhaust system, I used "block hugger" manifolds, as sold for an MGB V8 (Rover conversion). 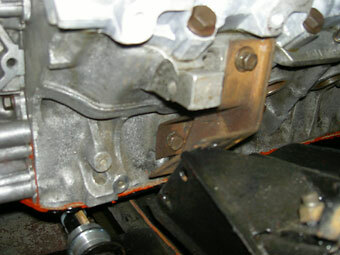 These worked well, althought one of the collector pipes had to be bent closer to the engine block for frame clearance. The exhaust pipes and silencers are stainless steel. Nice first try, but the engine needs to go further back. 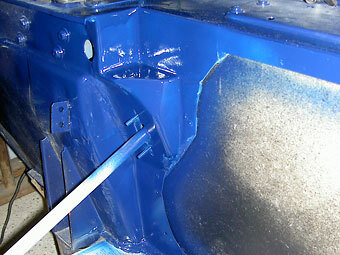 Chalk marks were made to plan where the sheetmetal will be cut back. The bulkhead and frame are ready, and the engine can be installed. 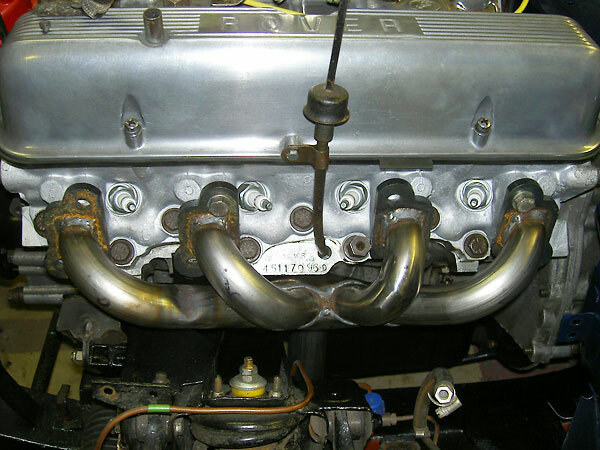 MGB V8 block hugger headers. Driver's side didn't need modification. 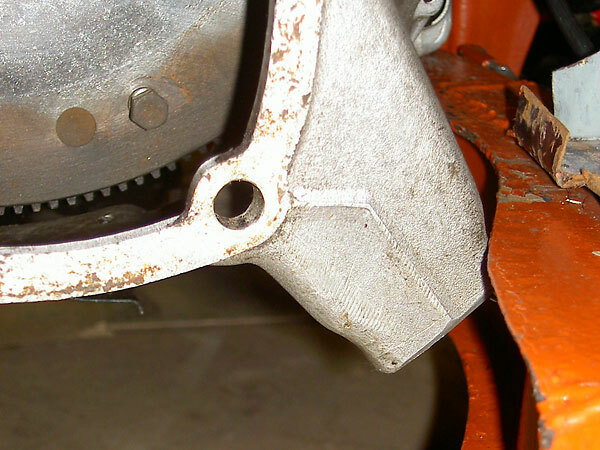 Passenger side header needs to bend inward to exit closer to the engine block. Modified stainless steel exhaust "Y-pipe". I had some problems with the carb which came with the engine, so I decided to treat myself to a new Edlebrock/Weber 4 barrel unit. I have a GT6 fibreglass bonnet fitted and without an air filter I could just about close the bonnet. (The carb wouldn't be able to breathe though.) I pondered about whether to go for the subtle approach or the in-your-face one. The latter won. I ended up fitting the circular air filter you see in the photos, and cutting a hole in the bonnet. Next, I fabricated a frame of thin aluminium strip and riveted and bonded this onto the bonnet, I then covered the frame with cardboard to get the shape I wanted. The labour intensive part was covering the cardboard with glassfibre mat and resin followed by glassfibre filler and finally many hours of rubbing down and refilling before I was satisfied with the result. I have now got to decide whether I need to beef up the rear. I'm currently running with standard Spitfire differential and halfshafts. I have several options; either purchase some upgraded GT6 halfshafts and a beefed up racing diff, or be prepared to launch into another project next winter and modify and fit a Jaguar back axle unit, or a Ford Sierra LSD or Subaru LSD and a fully independent coil over shock rear end. Decisions, decisions! I've done about 200 miles in the car so far, and recently taken it for its MOT which it passed without problems. I've only taken the car to one Triumph Sports Six Club meeting so far, but it certainly draws the crowds. Good job I never tire of telling interested people how it was done!